Jon Gillock, renowned for his writings and performances of Messiaen’s organ music, makes the first recording on the comprehensive 111-rank pipe organ at The Church of the Ascension, New York, built by French organbuilder Pascal Quoirin in 2011 with both electric and tracker-action consoles, optimized to play French repertoire and especially Messiaen, and capable of playing most any repertoire. Messiaen's Méditations sur le Mystère de la Sainte Trinité (9 Meditations on the Mystery of the Trinity) was composed for Messiaen's concert given in Washington, D. C., at the Basilica of the Immaculate Conception on March 20, 1972. 2 CDs for the Price of One! 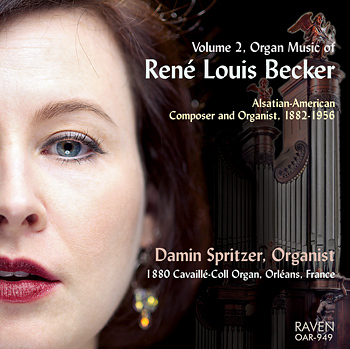 ****Four-Star Review in Choir & Organ, "Spritzer proves a committed and eloquent advocate . . ."